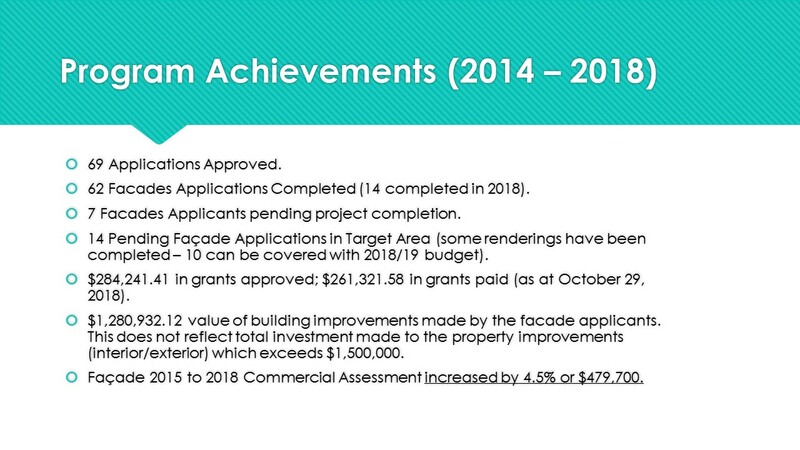 Façade Program achievements from 2014 to 2018. Complete presentation of the pdf 2018 Façade Program Update (1.86 MB) available. While most towns in Nova Scotia were settled as either French or an English colony, Yarmouth was settled by both at different periods in time. In the early 1600’s a French fishing settlement was established, where Yarmouth stands today. Over a century later, the town of Yarmouth was settled by a group of New England Planters. Following the Seven Years’ War Acadians who were exiled returned to the area, followed after the American Revolution by a large number of United Empire Loyalists arriving in the late 1700’s. This dynamic history is reflected in Yarmouth’s existing built form. Yarmouth is filled with extravagant, handsome buildings from centuries ago, and is known for having the “most exuberant” examples of Victorian style houses in the Maritimes. These houses were the homes of wealthy captains and ship-owners, and the buildings left today are mementos of that age. In contrast to the Victorian houses, Yarmouth is scattered with brick and stone buildings, with arched windows and handsome detailing. When looking through archived photos you can see the diversity of buildings that lined Main Street. However, over the course of the years a majority of the buildings have been lost to fire and demolition. The Town of Yarmouth offers a façade improvement grant program to assist downtown property owners and tenants with the financing of street-oriented building façade improvements. The facade improvement program is administered by the Yarmouth Facade Society, a not-for-profit volunteer board with support from the Town’s Economic Development staff. High-quality storefront and façade design. Preservation and enhancement of upper-storey facades. Implement the Town’s downtown urban design policies. Property owners and merchants/business owners are eligible to receive grants of up to $5,000 per civic address or storefront. Buildings on corner lots, where façade improvements are proposed on both frontages, are still only eligible for grants of up to $5,000. The total value of any grant may not exceed 50 per cent of the total cost of eligible works. No municipal street address or storefront shall receive more than a total of $5,000 under this program. Grants are subject to the availability of funding. Grants are issued upon the completion of the proposed work. Only those properties located within the Downtown Facade Improvement Area pdf (Facade Map Update, 2018) (9.52 MB) with commercial uses are eligible. Only those applications which satisfy the town's downtown urban design standards (see here) and the town’s downtown façade guidelines will be eligible to receive grants. All applications must be capable of satisfying the town's sign bylaw (See here part 6 of land use by-law) and the National Building Code (see here). If the total value of all grants applied for exceeds the amount of funding available, grant will be approved on a first come first basis. Repainting, cleaning or re-facing of façades. Repair or restoration of façade masonry, brickwork or wood. Replacement or repair of windows as part of the overall façade improvements. Entranceway modifications that improve the appearance and/or access to the commercial units. Redesign and reconstruction of the store front. Installation of appropriate new signage or improvements to existing signage. Installation or repair of canopies and awnings. Installation or repair of exterior lighting. To arrange a meeting, please contact Natalie Smith, Economic Development, at 902-742-1505. All successful grant applications will be subject to the terms and conditions as they relate to the façade improvement grant program.